What are your thoughts on the Elgin nomination? I’m over the moon that PrimObs, a book at the crossroads of various genres, has found readers in the sci-fi/fantasy community, home to some of my favorite literature. That sci-fi/fantasy poetry enthusiasts have liked the book enough to nominate it for an award like this gives me renewed faith that my genre or genre-inflected poems, which often feel to me like they exist inside a vacuum, do make a difference to people. Did you have any immediate reaction when you got the news? The first thing I did upon learning of the nomination of PrimObs was to save the list of other nominees. This is the summer reading list I’ve always wanted. My writing has actually been moving in a more sci-fi/fantasy direction since PrimObs. I’ve recently completed a manuscript of sci-fi/surrealist poems full of robots, amphibian people, dinosaurs, surgical experiments, etc. I expect the trend to continue! 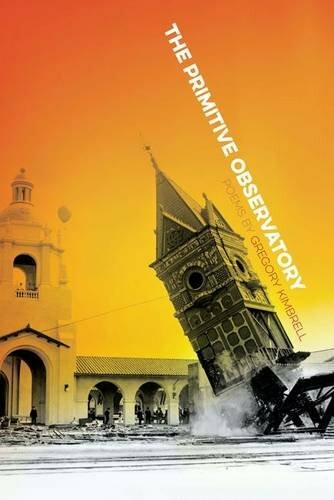 Gregory Kimbrell’s The Primitive Observatory is available from major online bookstores [Amazon | B&N], and is available for order from your local independent bookseller. The people in your poems have names like Albrecht and Hilde. They inhabit lodges, verandahs, and salons. Their time is spent in occupations that seem at times foreign to the last century of American life. What sources do you draw from to create these worlds? What about movies? Few people I know have the same depth and breadth of knowledge that you do in this area. Are they important for your work? Movies are another important source for my work. I spend more time with movies than I do with just about any other type of creative endeavor; I watch at least a part of a movie every day. And particularly B horror and sci-fi. I know that for many people the B stands for Bad and that B movies are, at best, a great joke. It’s true that when I watch B movies I laugh a lot—years later, I’m still laughing about that dance routine in The Island Monster—but even when B movies are unbelievably awful, they have an unpredictability and a sense of the sheer joy of creation that are too seldom found elsewhere. Maybe because B movies have relatively small budgets and so also have relatively little riding on their success, things that would never pass muster in major movies marketed to general audiences parade unashamedly across the B-movie screen, and even when I know with almost perfect certainty that the scruffy down-and-out hero will be betrayed by his slick business-executive ex-wife, I can’t help but be astonished when he, along the way to that betrayal, discovers a UFO inside a mountain and is chased by a killer cyborg—this, by the way, is the plot of Top Line. Anyway—there are certainly many B horror movies in the Gothic tradition, such as the majestic Nightmare Castle—although period B movies tend to be fatally boring, and nothing is more boring than a B movie set in the Middle Ages; I’m currently working my way through a Spanish turkey called Star Knight, about a princess who falls in love with a humanoid alien whose spaceship is parked beneath the surface of a nearby pond—but I think that my poems have absorbed some of the absurdity of many of the hundreds of B movies I’ve watched, regardless of their milieu. 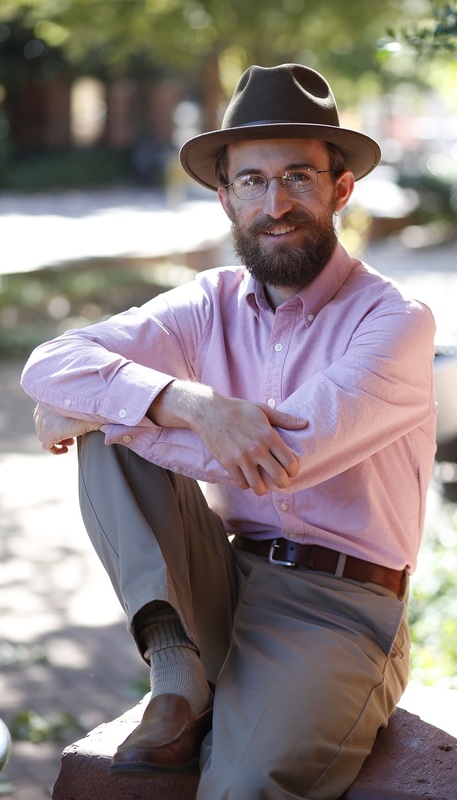 When Kathleen Graber once described my poems as having a campy quality, I was thrilled. Can you talk about how the process of bringing a poem’s setting to life works for you? Do you have any other tools that you use? When I start drafting a new piece, and also when I’m stuck in the middle of a draft, I’ll try, in my imagination, to visualize all the details of the space that I want the poem to inhabit: the light fixtures, the flooring, the pillow cases—countless details that may not make it into the finished work. Listening to music can help, especially electronic music with its alien sounds. Haruomi Hosono released a series of minimalist sound-art-ish albums in the mid ’80s; those are a touchstone for me. Early video-game music is also perfect for visualizing space—especially given that the music in early video games was composed and engineered to help make very limited two-dimensional visual worlds more immersive. The strangeness and narrative strength of your poems have drawn early readers to liken your work to creators in other forms or media, from Edward Gorey to Marcel Proust, from H.P. Lovecraft to David Lynch. I feel that, but I also know how important many traditions of poetry have been to you. Can you talk a bit about the poets, dead or alive, who inform your own poetic sensibilities? I feel an affinity, certainly, for poets who were writing around the turn of the nineteenth century to the twentieth, and I think of The Primitive Observatory as, in a sense, participating in the tradition of Romantic/Gothic/supernatural/weird poetic narrative found in the work of authors such as Alfred Tennyson and Alfred Noyes. And of course, there’s Edgar Allan Poe—although I feel a greater affection for Poe the writer of short stories than Poe the poet. When I was in graduate school, David Wojahn introduced me to the work of French poet Jean Follain. The poems in his Transparence of the World often have an eerie, enigmatic, and even Goreyesque quality of seemingly disparate events occurring in concert according to the obscure doom that is the past. My poems “The Marshes” and “The Sluice Gate” were written originally in partial imitation of his unique aesthetic. Which poets do you find yourself returning to regularly? James Merrill was the first poet whose work I ever read for pleasure. Although I don’t mirror in my book his interest in meter and rhyme, reading his poems has taught me a great deal about the integrity of the line—even if my principal allegiance is still to the sentence. His bizarre and regal The Changing Light at Sandover continues to be one of my favorite books. I reread it periodically to remind myself of why I started writing in the first place. My favorite poet is Kenji Miyazawa. “The Passing Brigade” in The Primitive Observatory is an homage to one of his most famous pieces, “Pine Needles.” Kenji was among the first wave of Japanese poets to explore free verse, which he used to make what he called “mental sketches,” attempts at capturing in words the bottomless mystery of lived experience. His poems, with a vocabulary enriched by his background in agricultural science and Buddhism, tend to have a wild, hallucinatory quality. The Primitive Observatory has little in common with that, but when I seem to be stuck in my writing, I often consult Kenji as though he might show me the way. He also wrote curious and very moving prose fables, many with anthropomorphic animal characters. His novella “Night on the Galactic Railroad”—which, I have to say, was also made into one of the world’s best animated movies by director Gisaburо̄ Sugii and featuring electronic Satie-esque music by none other than Haruomi Hosono—is a major thematic influence on a second book manuscript that I’ve recently completed. It’s exciting to hear that you have another manuscript finished! How did your process for creating it differ from that of The Primitive Observatory? Did you find yourself writing different kinds of poems, or drawing from different influences? While I wrote the poems and sequences of The Primitive Observatory as discrete pieces—each its own little experiment in narrative—this new manuscript, which consists exclusively of two thematically related sequences of longer narrative poems, was conceived of as a unified project from the outset. I outlined it as though I were writing a novel. The finished thing sits somewhere between one of those sprawling European novels I mentioned previously and a work of fantasy horror. One of the characters from the manuscript actually appeared in my dreams soon after I’d started drafting it, and I took that as a sign that it needed to exist. 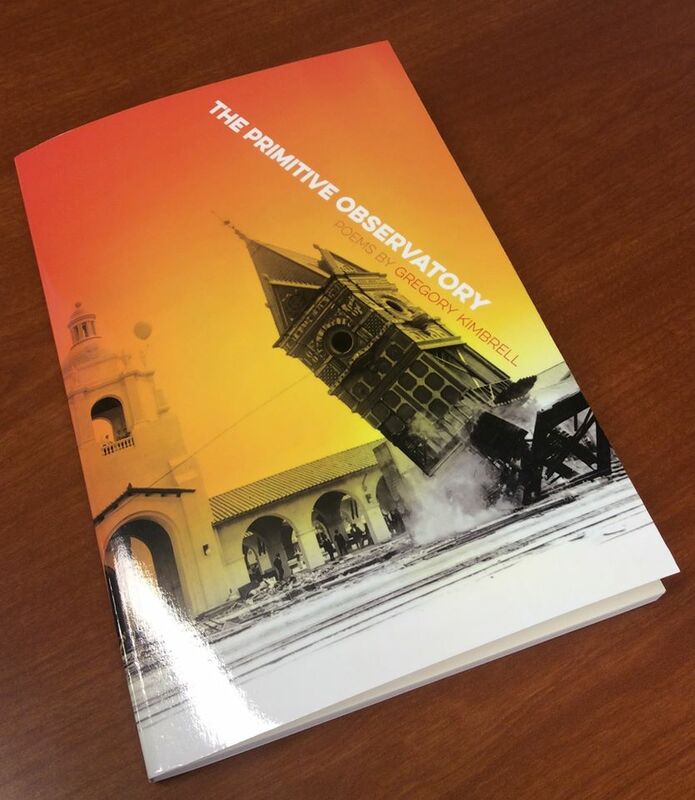 This week featured many excitements, but none better than the release of The Primitive Observatory [ Amazon | B&N | Goodreads], the first collection of poems from Gregory Kimbrell. This astonishing book of poetry, which won the First Book Award in the Crab Orchard Series in Poetry, has already drawn analogies to: Chekhov, Escher, Gorey, Kafka, Lovecraft, Lynch, and Proust. Reader, it was my delight to see this collection in draft, and all of those analogies are appropriate. If those names resonate with you, I urge you to pick up my friend’s new book! You won’t be disappointed. “Write what you know” works until it doesn’t. How do you write about 1798 Pennsylvania? A journey to Alpha Centauri? Eating dinner as a parrot? Hiking in the desert? The experience of characters with different lives than your own calls for more than imagination, it requires research: archives, travel, diaries, interviews, etc. Workshop members will carry out weekly exercises to practice different kinds of research, learn how to incorporate new information into their fiction, engage in group critiques, and ultimately complete a short story integrating information derived from multiple kinds of research.